We at Effesenden Music are fiercely proud of the natural beauty of our Pacific NW home. It is always so cool when we get to work with couples from out of state who choose to celebrate their wedding day in our beautiful Columbia Gorge! 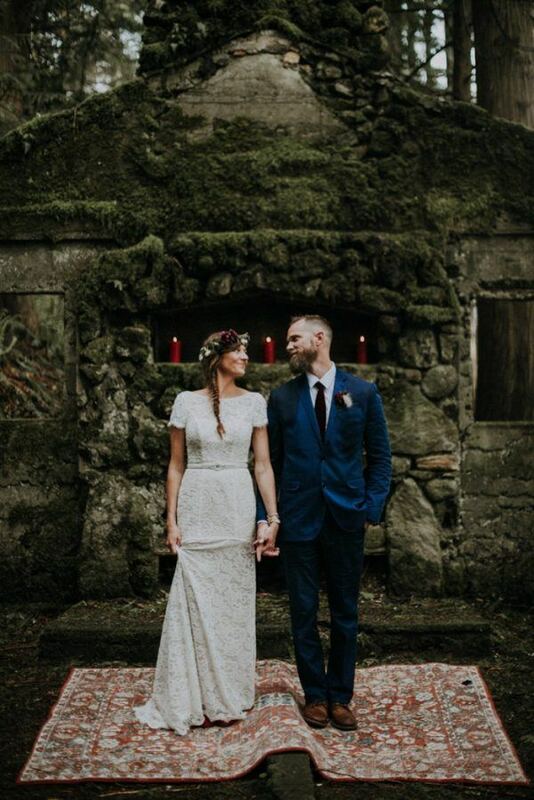 Danielle and Ernie are a gorgeous couple, incredibly sweet and obviously very adventurous: the “hike” to the ceremony site was something I’d normally be donning my backpacking boots for thanks to a seriously crazy rain and hail storm that arrived just before the ceremony. Still, we managed to make our way up the trail to this hobbit-like venue and provide music for Danielle’s entrance. We don’t know how she did it in those shoes and without a speck of dirt on her stunning gown! Also love it when we find ourselves featured on the wedding style blog Junebug Weddings. Though the musicians often are not pictured since our role is about the sound versus the look, we feel honored to be in such chic and creative company. Next Next post: Our Acoustic Duo at the Lovely McMenamins Edgefield!